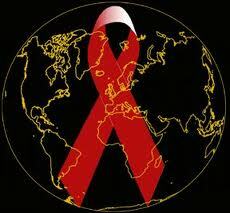 Today (December 1) is World AIDS Day. I’d like to take a moment to remember all those who have been affected by HIV/AIDS and remember those we’ve lost, especially my fourth grade teacher Mr. Thomas Driscoll. During this holiday season and all year round, help those with HIV/AIDS and in finding a cure by supporting your favorite HIV/AIDS charity. Mine is Broadway Cares/Equity Fights AIDS which helps bring resources to those with and affected by HIV/AIDS across the United States. 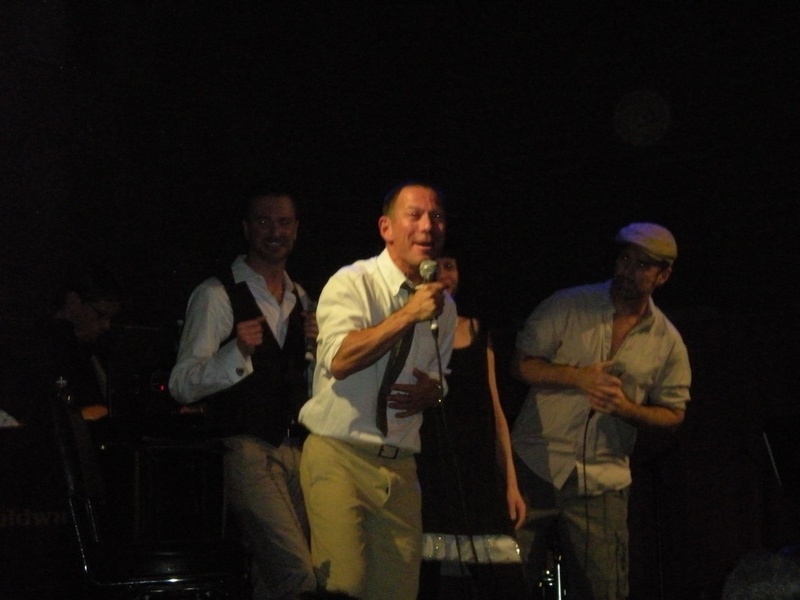 On Sunday, February 28, I got to see “The Tonics” perform at Joe’s Pub. After being apart for 15 years they have reunited to bestow their beautiful harmonies upon us once more. “The Tonics” consist of fellow “Adaumbelle’s Quest” participant Cortes Alexander, Michael Patrick Coughlin, Gene Reed, and newest member Kathie Talbot). Watching “The Tonics,” for me, was like watching an old-fashion quartet with a very modern sound as they performed a mixture of original songs & covers with “The Tonics” touch added to them. Separately each member is an accomplished musician, but together they really rock! I hope a continued resurrection is in store. Their chemistry is so strong, it makes me I feel like I was watching my friends perform. If you’re looking to be taken back to a time when life seemed simpler & less complex, then come on down to Joe’s Pub next Monday, March 8 at 7pm to catch “The Tonics” one more time before they head back to LA! Oh yeah, it’s a benefit performance for BCEFA (Broadway Cares Equity Fights AIDS) so come support a worthy cause & enjoy some good music with friends. 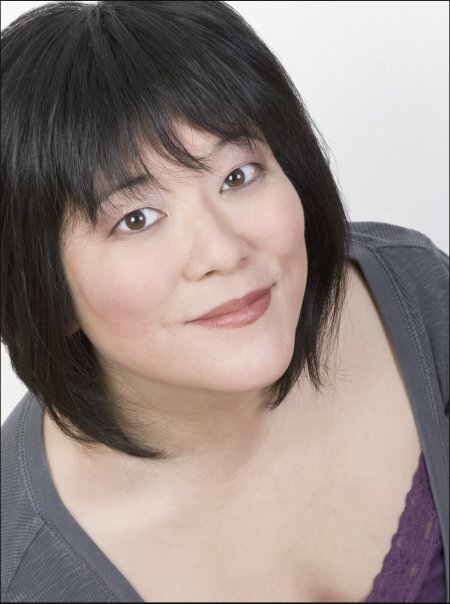 Be sure to catch fellow “Adaumbelle’s Quest” participant Ann Harada in “Christmas Eve with Christmas Eve” on Monday, December 14. 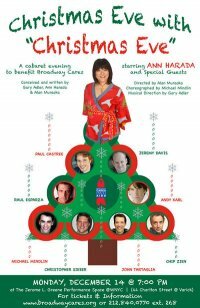 Watch Ann bring “Christmas Eve” (the role she originated in the Tony Award Winning Broadway Show “Avenue Q“) back for one night only in a benefit for Broadway Cares/Equity Fights AIDS. Showtime is 7pm at The Jerome L. Greene Performance Space @ WNYC, 44 Charlton Street at Varick. 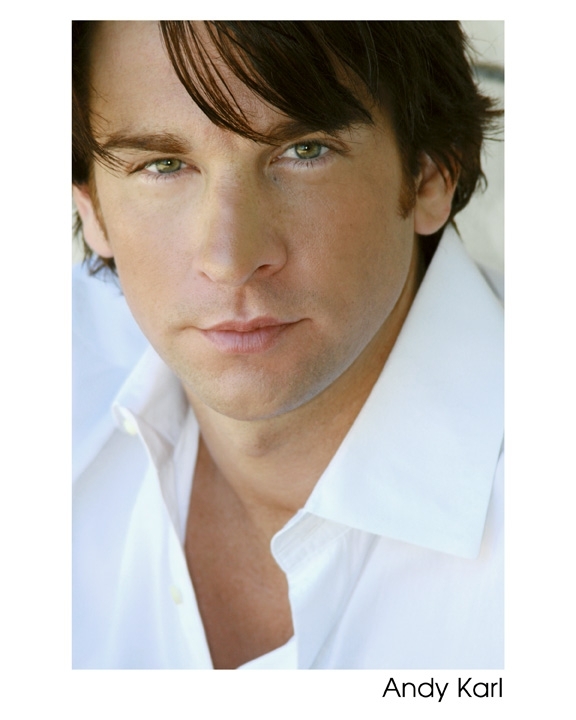 Special guests include: fellow “Adaumbelle’s Quest” participant Andy Karl along with John Tartaglia (“Avenue Q” original “Rod/Princeton”), Raul Esparza, Christopher Sieber, and Norm Lewis. Remembering those affected with and by HIV/AIDS, especially my fourth grade teacher Thomas Driscoll. Will always remember the voices you used when reading to us, especially Roald Dahl.